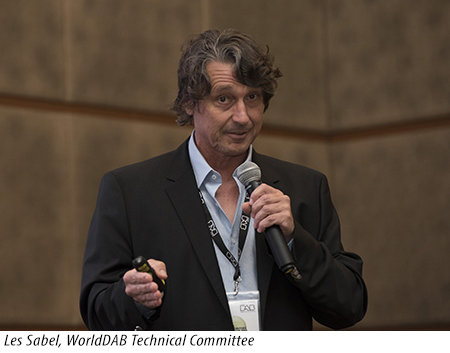 WorldDAB Technical Committee’s Les Sabel unpacked some of that challenge by sharing a vision for the future of broadcasting and audience engagement with media. Broadcasters can and must integrate new technologies to remain competitive, Sabel explained. Straker Coniglio from VIZRT shared statistics of smartphone use in Asia, for example - 97.9% of Malaysians are accessing the internet via their smartphone. Advertisers are responding to this trend by reaching consumers via social media and internet advertising, which creates a significant and looming revenue issue for local broadcasters. Advertisers are now able to target very specific consumers through social media. Broadcasters need to engage with new technology to deliver the sorts of content that audiences are looking for, and to start to be more savvy in how to help audiences to fulfil their desire and expectation to interact, without driving advertising revenue to other platforms. Sabel went on to explain how broadcasters will soon, if they aren’t already, be using technology to collect specific data – about what content is popular and engaging, and importantly, demographic data about their audiences. Broadcasters will be able to promote or supply specific content that a particular audience member might be interested in directly to their devices.